Lake Mburo is Uganda’s smallest savanna national park covering a total area of 370km2. 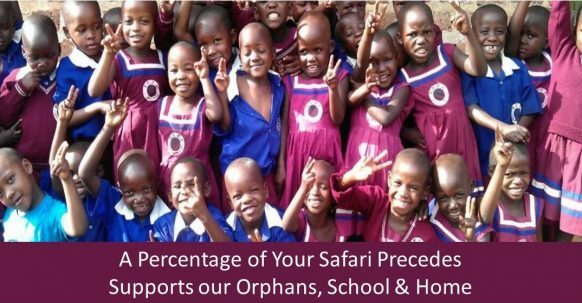 It is located approximately 240km west of Uganda’s capital city Kampala between the coordinates of 00 36S, 30 57E (Latitude:0.6000; Longitude:30.9500). It is about 45km east of Mbarara town (one of the biggest towns in western Uganda) and 33km from Igongo Cultural Center a key destination for tourists on cultural safaris to Uganda. 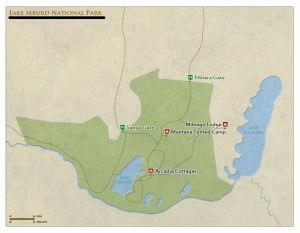 Lake Mburo is therefore the closest of all Uganda’s National Parks to the capital city. Mammalian species, The park’s many habitats ranging from the wetlands, the savanna green valleys, forested zones and highlands; provide sleeping and resting spots for up to 68 mammalian species. Although a number of mammal species have been hunted into extinction like the lions and the roan antelope over the years, Lake Mburo National Park doesn’t seem to run out of life. The park is more popular for its population of grazers including the defassa waterbuck, three (3) species of topi, bohor reedbuck, healthy number of ferocious buffalo warthogs and bush pigs, the gorgeous Klipspringer which poses on rock outcrops and anthills and the impala which cannot be seen anywhere else in Uganda. The park is also home to the Burchell’s zebra which can only be seen in two (2) other protected areas of Kidepo Valley National Park and Pian Upe Wildlife reserve; and recently there has been the translocation of 15 Rothschild’s giraffes from Murchison Falls National Park to Lake Mburo National Park. Lake Mburo also boasts of 300 hippopotamuses, crocodiles and the endangered sitatunga antelope which can be seen in and around the park’s wetlands. Lake Mburo also has a number of primate species which enjoy swinging among the Park’s branches including the Vervet monkeys and baboons which can be seen during a game drive or at the Conservation Education Center at Sanga. Most of the flesh-eating animals are nocturnal and can best be seen early in the mornings or in a night game drive. They include gangs of spooky hyenas, side-striped jackals, the white tailed mongoose and a number of leopards. A well-known wildlife author once spent a night at the Mihingo lodge in Lake Mburo National Park and exclaimed that he had never seen more leopards in any other National than the ones he had seen in Lake Mburo National Park. Bird species, Lake Mburo National Park has an estimated 350 species of birds and forty (40) of these species can be found in Rubanga forest which is part of the park. Most of the park’s birds are southern birds including the southern ground hornbill, green capped eremomella and the black collared and black throated barbets. In the swamps tourists can get to see up to six (6) species which are endemic to the papyrus swamps including the striking blue headed coucal, the highly localized white winged and papyrus yellow warblers, colored papyrus gonolek and the Red-faced Barbet which has not been seen anywhere else in Uganda. Other birds include the bare-faced go-away bird, black bellied bustard; Ruppell’s long tailed starling and the mosque swallow which can be viewed around the Rwonyo rest camp. Adding to the list is the endemic African Finfoot, Blue-breasted Kingfisher, Carruther’s Cisticola, African Scops Owl, Brown-cheasted Plover, Tabora (Long-tailed) Cisticola, Abyssinian Ground Hornbill, Hairy-breasted Barbet, White-winged Warbler, Brown-chested Lapwing, Yellow-rumped Tinkerbird, Saddle-billed Stork, African-wattled Lapwing and the rarely seen shoebill. Lake Mburo, The story behind its formation is something to sit down for and listen to but it’s not just about the stories told but the life that lives in and natural life which is drawn to it. It can be referred to as a natural refuge for fauna and flora. Most of the animals are seen during the dry season when they gather around the lake for a drink of water while others live in the lake or around it for the larger half of their lives including the hippos and the crocodiles. A number of resident birds can be seen around the lake area including African Fish Eagles, skillful Pied Kingfishers, Malachite Kingfishers, Blue-headed Weavers and the Rufous Long-tailed Starlings, the large Pelicans, rare Shoebills, Herons, Green-necked Doves, the hammer-like headed Hammerkops, and the Cormorants. Rubanga Forest, The forest forms a small section west of the park but is compacted with life. Tourists who engage in guided nature walks within Rubanga forest will get a taste of true African tropical forest with a closed canopy with the ability to accommodate up to forty (40) of the park’s bird species including the Narina Trogon, the Double-toothed Barbet, Grey-backed Cameroptera, Harrier Hawk and the Green Pigeon. It is highly recommended that tourists visit the forest with an armed ranger guide who will not only identify the different species for them but also ensure their safety. Birding safaris in Lake Mburo National Park, A birding safari necessitates tourists to make arrangements with the park’s management so that they can book for them ranger guides in time. Birding in the park can take place in the Rubanga forest walk which houses about 40 of the park’s bird species; around the wetlands; or it can start at the Rwonyo rest camp. With a list of 350 bird species, tourists can prepare to see the Yellow-rumped Tinkerbird, Abyssinian Ground Hornbill, Brown-chested Lapwing, Carruther’s Cisticola, the African Finfoot, the rarely encountered shoebill, White-winged Warbler, Hairy-breasted Barbet, Saddle-billed Stork, Brown-cheasted Plover, African Scops Owl, African-wattled Lapwing, the African Kingfisher, pelicans, the Tabora (Long-tailed) Cisticola, Blue-breasted Kingfisher and the hammerkops. Game drives in Lake Mburo National Park, Game parks are permitted by the presence of finely marked out trails in the park on which the vehicles can move. The roads are dry weather roads and can sometimes be challenging to traverse especially if the vehicle is not a FWD. the better half of the park where most animals can be seen is the eastern part of the park which also challenges tourists to undulating altitudes but rewards them with beautiful landscapes features like the kopjes and wetlands (both permanent and seasonal). The daytime game drive can start at any time of the day but game drives are more rewarding if they start at around 6:30am because visitors get a better chance of seeing the night-time fauna heading back to their hiding spots after a night of hunting. An alternative would be to start the game drive at 6:30pm or 7:00pm when the nocturnal animals come out to hunt. All game drives last between two (2) and three (3) hours. Nature walks in Lake Mburo National Park, A more fascinating way to encounter the African wilderness is to leave the vehicles and travel on foot but it is highly advisable to walk through the jungle with an armed ranger guide just in case the animals do what they are good at (going wild). Tourists are opportune to walk on the same tracks which the faunas walk on and can take close-up photos of the park’s diversity. The nature walk nnormally starts at 7:00am and can end at around 9:00am or 9:30am. Other trails for the nature walks are in the Rubanga forest where tourists can see a number of bird species. Tourists can also decide to hike up to the Kazuma hill and can be rewarded with glorious views of the park’s vegetation, wetlands and animals below. Boat Cruise, The boat cruise sets of from the Rwonyo pier and takes tourists around the legendary Lake Mburo in which they can see animals like the hippopotamuses, predatory crocodiles including the animals which parade the lake shores for a drink of water like the zebras, waterbucks, kobs, buffalos and birds like the African Kingfisher, pelicans, and the rare shoebill. The boat cruise lasts about two (2) hours and is indeed an exhilarating experience especially for those who have never been on one. Sport fishing, In order to participate in this activity, tourists will have to make prior bookings either directly to Uganda Wildlife Authority (UWA) or through a tour operator so that the fishing gear used in the exercise is borrowed in time. It is only UWA that can give rightful authorization to visitors to participate in this activity. There is an abundance of wetlands with a healthy number of fish species including the tasty tilapia. Horseback safaris Lake Mburo National Park, Lake Mburo is the only park which offers horseback safaris. This is an entirely new way of encountering the African wilderness on the back of a domesticated animal. Unlike in the game drives where some shy animals run when they hear the sound of the car engines, during the horse rides most of the animals stay because the horses are like fellow animals. The horseback safari is currently being organized and managed by the Mihingo lodge and can last up to four (4) hours. Along the way tourists can see animals like the topi, bushbucks, impala, eland, zebras, duikers and warthogs. The lodge also offers tourists the opportunity to enjoy a bush breakfast as part or exclusive of the horseback safari. Cultural encounters, Lake Mburo is surrounded by two major local communities, the Bahima and the Banyankole who are both large-herd cattle keepers. There is a cultural center just outside the park which showcases the cultures of the Hima people and preserves the Ankole long horned cattle, a unique breed of cattle which is quickly disappearing due to the introduction of exotic breeds in the region. Tourists can visit the homesteads of these people which are just outside of the park and are free to watch as they carry out their daily duties. The communities have grown used to the tourists and some of them are permissive to tourists to participate in some of their daily activities. The peoples tell very interesting stories and make awesomely entertaining music. The park on a good day with no traffic can be accessed from the following points in Uganda. Located at the park headquarters, this is an UWA owned and managed accommodation center which offers budget accommodation to tourists on Safaris to Lake Mburo National Park. The different accommodation options include a camping ground, bandas and tents mounted on wooden platforms. Tourists who set up their own tents are allowed to use the camping ground for free. The bandas constructed using locally sourced materials like wood and straw for the roof. The camp offers clean bathrooms and lavatories but this are shared with all the occupants. Snacks, soft drinks and beers are served at the park’s canteen but real meals can be found a short drive (1¼ km) to the Lakeside Restaurant or at the luxurious Arcadia Cottage. The camp management can also arrange transportation to the eating points at a fee of 10,000/= on a motor bike. Rwonyo is visited by a number of faunas including the primates enabling tourists to experience the park before embarking on a game drive. Tourists will not have to travel any far for the pre-activity briefing exercise because Rwonyo is the starting point for most of the tourist activities. As of now, Uganda features a count of 10 national parks including Mount Elgon National Park in the east, Kidepo Valley National Park in the north east, Murchison Falls National Park in the north west, Kibale National Park, Semliki National Park and Rwenzori National Park in the west, Queen Elizabeth National Park, Bwindi Impenetrable National Park, Mgahinga Gorilla National Park and Lake Mburo National Park in the south west. Right from the colonial era, a range of national parks have been gazetted in the countries of Uganda, Rwanda and Congo over time and the independent national governments have continued with the initiative. There is a mystical story that is told about the formation of the lake. It is believed that many ages back, the grass-fertile area on which the park sits was occupied by generations of cattle keepers who also grew some crops on a small-scale. Among the settlers included two brothers called Mburo and Kigarama who both had their own animals and used to move with them throughout the valley in search for eating and drinking spots for their animals. One night when he was deep in his sleep, Kigarama had a dream in which the valley was completely covered by floods. In the morning Kigarama narrated what he had seen in his dream to his brother and supposed that this was a warning from their gods and beseeched his brother to follow him with their property to the top of a nearby hill. However Mburo just laughed it off and continued grazing his animals and doing things like he always did on any other normal day. Kigarama left the valley with his property and climbed a hill. It didn’t last long until the heavy rains fell and flooded the entire valley forming a lake which covered Mburo and his property. The floods also formed some other swamps which attracted animals and birds of all sizes and colors. 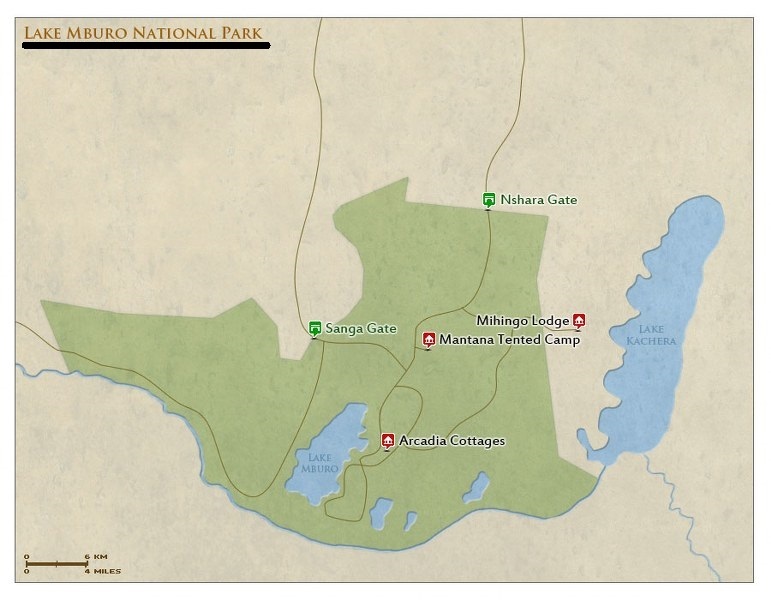 The lake was named after Mburo and the hill where Kigarama took refuge was also named after him. They both still exist and can only be seen when on a Uganda Safari to Lake Mburo National Park. Lake Mburo National Park is home to over 66 mammal species including grass and flesh eating mammals of all sizes like he 300 hippos, burchell’s zebras, the newly reintroduced Rothschild’s Giraffes, several antelope species and the warthogs. The park also has a number of reptiles including the reptiles which dwell mostly in its wetlands. Some of the wildlife can be seen even before reaching the gate to the National Park as they search for greener pastures and for more flat areas from which they can easily see the carnivores from a distance. Animals like the aggressive buffalos and the zebras can be found on the neighboring farmlands. Lake Mburo national park has a number of bird species including the uncommonly seen shoebill, the white winged warbler, the African fish eagles and the red faced barbet which can only be viewed in Lake Mburo National Park. In total birders can be delighted to see over 300 bird species in Lake Mburo National Park. Some of the animals that used to reside in the park seize to exist including the elephants and lions many of which were hunted down by members of the community while others died because of change of vegetation (especially with the emergence of invasive vegetation species principally the acacia vegetation) which replaced the endemic tree and plant species on which those animals thrived. Today the park still has a big number of animals which were able to survive through this hard age. In a bid to protect the park’s resources especially from human activities like poaching that the surrounding communities were fond of doing, the lake Mburo was established as a controlled hunting area in 1933 and then gazette into a game reserve thirty (30) years later in 1963. Under the government of Dr. Milton Obote, the park was upgraded to its current standard (a National Park) in 1983. Ever since the park was gazette, the majority of the people who live around it have had a negative perspective about it. The surrounding communities are agriculturalists who keep graze their cattle and grow food crops for their families and the surplus can be sold to earn a living. Previously, the local communities freely moved from their settlements through the park area to access water for their animals to drink and to use in their homesteads; and to collect firewood which they would use for cooking. However, when Lake Mburo was gazetted, they were stopped from going into the park and this created a deep hatred for the park. When the animals crossed to their farmlands, they would brutally spear them to death or sometimes poison them. This relationship is expected to get better in the future especially due to the Park’s management to create a rapport. The park carries out periodic meetings in which they get to listen to the complaints of the locals and to respond responsibly. On a few designated days in the week, locals are allowed to go into the forest and collect firewood and get water under the supervisions of staff from the park. Also 20% of the park entrance fees is injected in the community in form of social amenities like treatment centers, schools, roads and in funding community developmental projects.